On June 23rd 2003, Tommy Wiseau premiered The Room to an unsuspecting LA audience, which included notable critic Scott Foundas, and the reaction was not good. The film was clearly supposed to be a drama, with the tagline “A film with the passion of Tennessee Williams.” but, according to Foundas, it resulted in laughter from the audience and people demanding their money back. 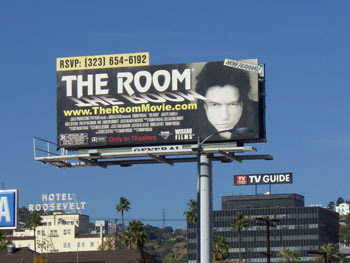 It was the creation of the relatively unknown Tommy Wiseau who paid an extortionate amount of money to place a billboard on Highland Avenue in LA for five years advertising the film. In fact one of the most shocking things about The Room is that it supposedly cost $7 million to make and market, despite the film looking a lot like a cheap student film. Wiseau is often asked about how he raised the money but has offered little more insight than the story that he made some of it selling imported leather jackets. Following a disappointing first run at the Laemmle, the film began to play at Midnight and in the tradition of Midnight Movies such as The Rocky Horror Picture Show, Reefer Madness and El Topo, The Room finally found its audience. The Room began showing regularly at Laemmle’s Sunset 5 in LA and as word spread it started playing to packed out audiences. As had happened with Rocky Horror the fans of the film began to make it their own; people began dressing up, wearing ties on their heads, having impromptu games of catch, yelling out lines and cheering and booing almost drowning out the film. The cult of The Room was born at these screenings in LA and the ‘yells’ that became popular have spread to subsequent screenings. The film began opening outside of LA, spreading to other American cities, Europe and last month Australia. Every time the film opens in a new town it is the buzz on the internet and the championing by critics such as IFC’s Matt Singer that has guaranteed packed theaters. Each time it has opened, audiences are already aware of the participation element and know all the yells and traditions either from the internet or guides handed out at the screenings. The most common thing you’ll hear at a screening of The Room is people shouting “Because you’re a woman!” any time an opportunity presents itself, a reference to the casual misogyny throughout the film but also a comment that can easily be applied for comic effect in many scenes. More abstract is the popular “Shoot her” which is inspired by the opening of Jurassic Park and according to the AV Club’s excellent ‘A Viewer’s Guide To The Room’ is in reference to the female lead’s twitching neck. It doesn’t just stop at yelling though as every time a framed spoon appears in the film (which they do… a lot) the audience throws plastic spoons to the front of the cinema. This can be seen in this excellent promo video the Prince Charles Cinema put together following the London premiere last year. In the video you can see writer and presenter, Charlie Brooker, and actor Matt Berry describing the unique experience of watching The Room. These aren’t the only celebrity fans that the film has attracted. Paul Rudd supposedly hosts The Room parties (the film received a DVD release in December 2005) and according to Entertainment Weekly he introduced Veronica Mars creator Rob Thomas to the film who in turn showed it to Kristen Bell. Thomas and Bell then started referencing The Room in Veronica Mars and Kristen Bell even talked enthusiastically about The Room when she appeared on Jimmy Kimmel Live on January 30th 2009 (starting around the 4:51 mark). Tommy even made an appearance on Tim and Eric Awesome Show Great Job! on March 9th 2009 and the following April 1st Adult Swim showed The Room as an ‘April fools joke’, helping further raise the film’s profile. Also fans of the film are the Rifftrax guys who put together their own commentary which you can get from their site here. There are also so many fan-made tributes for the film, including rap videos, recreations of the most famous line “You’re Tearing Me Apart, Lisa!” and even a mash up of Tommy Wiseau and David After Dentist. It is this dedication that the fans of the film have shown that has helped turn the film into a phenomenon which, seven years after it’s release, is still playing all over the world. If you haven’t seen it yet keep checking the official site as new screenings are constantly being announced. If you’ve never seen The Room, it is a film that you will not forget and certainly one of the most unique cinema going experiences you can ever have. Tommy Wiseau is such a unique character, with his long black hair, uncomfortable laugh and Eastern European accent (despite the fact he claims to have lived in the US his whole life) that he has inspired a lot of impersonations and I will wrap up with two of the best from Patton Oswalt and David Cross.